Sister Anne Gallagher, O.S.F., formerly Sister Margaret Leo, died Jan. 12 in Assisi House, Aston. She was 74. She had been a professed member of the Sisters of St. Francis of Philadelphia for 49 years. Sister Anne was born in Washington, N.J., and was a graduate of Washington High School. She graduated from St. Francis Hospital School in Trenton, N.J., in 1960 and worked there for several years after becoming an RN. She entered the congregation in 1962 and professed her first vows in 1965. Sister Anne earned a B.S. in nursing from Neumann University in Aston in 1974 and in 1982 became a certified registered nurse practitioner after studying at Indiana University of Pennsylvania/Allegheny Hospital. Sister Anne’s nine years of ministry in the Archdiocese of Philadelphia included working as a nurse at St. Mary Hospital in Philadelphia (1970-1972). From 2006-2013 she served as director of senior services for the Sisters of St. Francis, a position that later became part of the congregation’s pastoral services department. 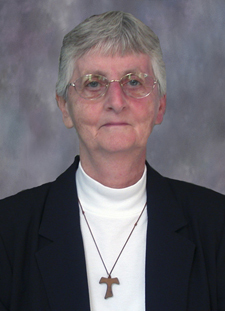 Sister Anne ministered in St. Joseph Hospital in Lancaster for 13 years, first as a nursing supervisor (1965-1970) and later as a nurse practitioner (1982-1990). Sister Anne also ministered in the Diocese of Wilmington and the Diocese of Allentown, mostly in health care. She received the Alvernia College Student Government Outstanding Staff Member Award in 1994. Funeral services will be held in Our Lady of Angels Convent Chapel, 609 S. Convent Road, Aston, on Thursday, Jan. 16 beginning at 10:30 a.m. The funeral Mass will be at 12 noon. Burial will be in Our Lady of Angels Cemetery in Aston. Sister Anne is survived by her brother and sister-in-law, James and Sue Gallagher; her sisters-in-law, Sylvia Clarketta Gallagher and Freddie Lynn Gallagher; her nieces and nephews; and her Franciscan family.